The Red Splint, Kathryn Lake Hogan, 2012. 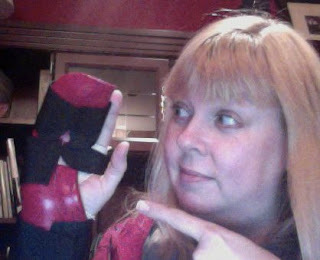 As you can see, I have got myself a new, shiny, red, plastic splint to wear for at least the next six weeks. The time I was planning to spend this past week-end and this week working on my webinar has been sucked up at the emergency room, doctor appointments, and a visit to the hand clinic. And, resting. There is now a slight change of plans. The webinar Ten Reasons Why Your Ancestor Was in Canada has been postponed until Thursday, January 3, 2013. Copyright by Kathryn Lake Hogan, 2012.